Blackmore's Night began as a side project to the reformed Rainbow. 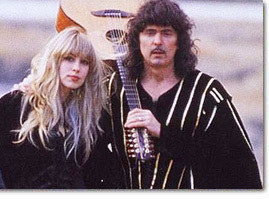 Blackmore and his partner Candice Night (a former model who had met Blackmore during Deep Purple's reunion spell with Joe Lynn Turner) were writing the material at least as early as 1994 (one of the songs appeared on the Rainbow reunion album Stranger In Us All), but didn't begin to record the new music until September 1996. Rainbow played some American shows in early 199, but after a gig in Denmark in May, Blackmore put Rainbow on hold to promote the first Blackmore's Night album. The band were told Ritchie might want to do some more shows with them later in the year, but they couldn't afford to wait and see. 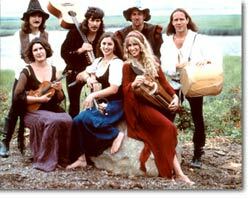 The first Blackmore's Night touring band included Argentinian born session bassist Mick Servino, ex-Sweet Little Sister guitarist and vocalist Jessie Haynes, and Rainbow's 1994-95 drummer John O'Reilly. September 1997 shows in Europe were postponed when Blackmore suffered a hand injury, and instead the band's live debut was in Tokyo on November 2nd. For the rescheduled German tour in December the band encouraged fans to dress in medieval costume, with the front rows of concert halls reserved for anyone thus attired; this has now become a Blackmore's Night tradition. Once work was completed on second studio album 'Under A Violet Moon', a new touring band was assembled in the summer of 1998. Drummer Kevin Dunne had contributed to the album, and was included in pre-publicity for the forthcoming 'Shadow Of The Moon, Electric / Acoustic Tour', but at the last moment had to be replaced by session player Alex Alexander. The shows were mainly in Germany, with some more alternative venues played, including a church and a castle, the latter as a showcase for invited guests. (photo. Back row: Mick Cervino, Ritchie Blackmore, Adam Forgione, Kevin Dunne. 'Under A Violet Moon' was finally released in May 1999, and made further inroads into the German market. Compared to the debut, the guitar was contained more within a group context, while the material featured more traditional German singalong styled songs than its predecessor. German renaissance music re-enactors "Des Geyers Schwarzer Haufen" contributed to the album, after playing support on the 1998 Blackmore's Night tour. In the summer of 1999, Blackmore's Night went for their first fully-blown castle tour, taking in Italy and Germany. For these shows Blackmore decided to do without an actual bass player, although Cervino was brought back for the band's first American shows, played in October. Cervino has since said that Blackmore's Night was by "far the quietest band I've ever played with. I was regularly told: "The bass is too loud!" Ritchie wanted merely a hint of a bass, which at times made me feel I wasn't really needed." Des Geyers' multi-instrumentalist Albert Dannenmann began touring with Blackmore's Night in early 2000, as the support act demonstrating his collection of medieval instruments, and also filling out the headliners' live sound. In return, Blackmore played on one track of Des Geyers' live album. Blackmore's Night played their first UK tour in May 2000, kicking off at the Grand Opera House, York. The shows were a success, and by the time of their return in 2001, most fans who had originally gone along hoping for an evening of rock music had either accepted the band for what they were, or had been replaced by new fans. Preceding the annual jaunt around German castles, experienced session musician Chris Devine replaced world-music specialist Jim Hurley, contributing guitar, mandolin and recorder. Some of the shows were recorded for the VHS only release "Castle Tour 2000". Des Geyers' were again the support act in a tour which proved to be Mick Servino's last. However he was soon back in business with Swedish guitarist Yngwie Malmsteen's band. The Japanese issue of Shadow Of The Moon featured an instrumental version of 'Minstrel Hall' as a bonus track. A 1998 UK re-issue on HTD included the bonus track 'Possum's Last Dance', which was also the bonus on the US edition. None of the videos are avaialble on DVD. 'Behind The Music' was first released in Japan as 'Shadow Of The Moon'. Japanese TV showed parts of the video, and added extra material, with Blackmore discussing some of his classic riffs.